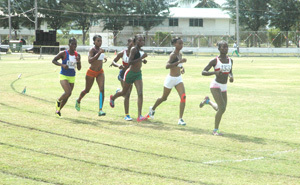 Guyana Police Force’s, Janella Jonas (leading) takes command of the Women’s 3000m race at ISAAC yesterday. the Guyana Police Force (GPF), after Day I of the Inter-Services Annual Athletics Championships (ISAAC), which is underway at the Base Camp Ayangana Ground. The Soldiers are heading into today’s second day of competition on their home ground with 138 points with the Police trailing on 130 points. City Constabulary has 21 points while the Guyana’s Fire Service is on 19 points with Guyana Prison Service 11 points. Cleveland Forde ignited hope of the army reclaiming the title they last won in 2011 with another classic performance in the 5000m men’s race. Forde took command of the race with two laps left in the 12 ½ laps event, igniting loud celebrations among the soldiers. Forde stayed closely on the heels of team-mate Tyshon Bentick, who was behind the bare-footed Police, Nathaniel Giddings. Giddings was the pace-maker for most of the race, before both Forde and Bentick jumped him with two laps left in the distance event. Forde then pressed on the accelerator with a lap to go, leaving Bentick in his wake and a host of Soldiers cheering him through the finish-line. It was clear that Forde had overcome Chikungunya that kept him from defending his Courts 10k title two weeks ago. Forde’s official time in the race was 15:52.2 while Bentick ran 16:02.4 for second, and Giddings 16:34.2 for third as the Defence Force took the two top spots in the race. Janella Jonas spoiled an attempt to do the same in the Women’s 3000m race. Guyana Defence Force’s, Patrick King takes flight on his way to winning the Men’s Long Jump yesterday at Base Camp Ayangana Ground. The seasoned athletes did not disappoint. Patrick King kept the soldiers ahead when he sprang to a massive 6.95m distance to capture the Men’s Long Jump. It was King’s second major title after winning the event at the Boyce/Jefford Classic in Linden in August. 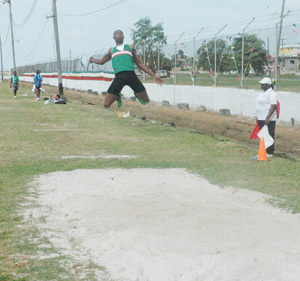 Police’s Yoel Benjamin was second with 6.61m while Defence Force’s, Carlos Haynes (6.57m) was third. Police’s Tracey Moses won the Women’s Long Jump with 5.57m as Defence Force’s Letitia Myles (5.27m) and Aniqua Powley (5.01m) was second and third respectively. The Soldiers won both Ranks 4x100m Relay ahead of the Police to close the day on a high note. On Sunday, the Guyana Defence Force also won the Road Relay race.